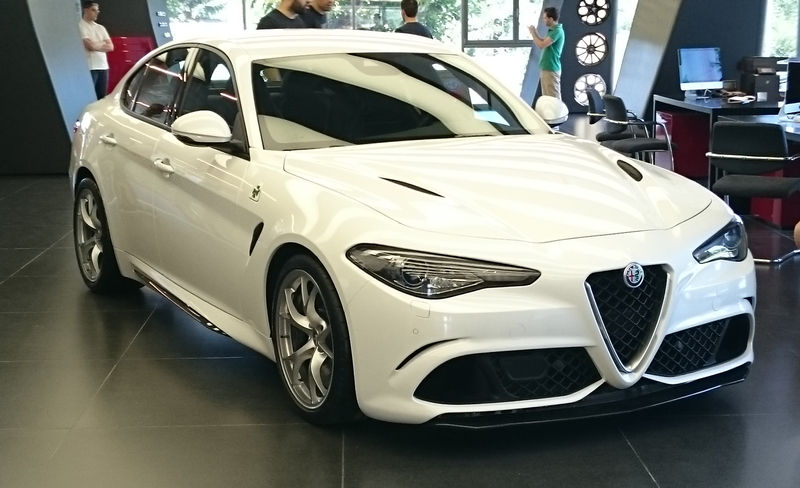 AUBURN HILLS, Michigan – Car shoppers who can’t wait until the second quarter of 2016 to see the 2017 Alfa Romeo Giulia Quadrifoglio high-performance sedan in Alfa Romeo showrooms can get an in-depth look at the car via a new online configurator. The launch of the configurator follows the debut of the Giulia Quadrifoglio at the 2015 Los Angeles Auto Show last week. In the meantime, the curious can check out the car’s standard features and specifications. The range-topping Quadrifoglio model targets the BMW M3, Cadillac ATS-V and Mercedes-AMG C63. The 2017 Giulia Quadrifoglio is equipped with a “Ferrari-derived” 2.9-liter twin-turbo V6 that produces 505 horsepower and 443 pound-feet of torque. The engine is mated to a six-speed manual transmission or a paddle-shifted eight-speed automatic. Edmunds says: The high-powered Quadrifoglio edges closer to reality with the debut of the online configurator.